Sometimes it feels like the only thing that can stop the Houston Astros from scoring runs is an injury. Well, they have one. 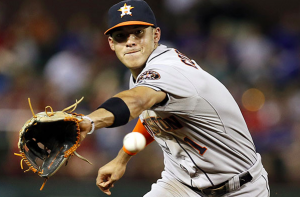 Thursday, the Astros announced all-star shortstop Carlos Correa is heading to the 10-day DL because of a sore back. The 23-year old last played on Monday. After he cut his pre-game exercises on Thursday a little short, the team wants him to get at least 10 days to get himself right again. There have been no recent signs of Correa’s performance being hindered by back pain. On the season, he’s hitting .268 with an OPS of .832. Those numbers are down somewhat from last season. But that could be explained by an unusually slugging month of May in which he hit .192. Even with that slump, Correa has 13 home runs and 49 RBIs. If he doesn’t miss too much time, he has a chance to set a new career-high in both categories. The origin of Correa’s back pain remains a mystery. On the surface, it seems odd for a 23-year old to have a sore back without a good reason. Nevertheless, the Astros don’t appear overly concerned. The club would like him back as soon as possible. However, it’s possible they will be a little extra cautious and wait until after the all-star break to bring him back. Marwin Gonzalez has filled in at shortstop the past few days that Correa has been out. Gonzalez has played at least one inning at every position other than pitcher and catcher this season. However, he’s seen most of his playing time in left field, so moving him to shortstop will hurt Houston’s outfield depth. Alex Bregman, a natural shortstop, could also step in for Correa during his absence. That could allow Tyler White to see time at third base, which is his natural position. Barring any unforeseen complications, the Astros should have Correa back at some point in the near future. They have more than enough quality hitters in their lineup to survive without him. Houston also has a somewhat comfortable 3.5-game lead in the AL West. Obviously, they want to hang onto that lead so they don’t risk falling into a wild-card spot. In the long run, they’ll need Correa as their everyday shortstop. But for now, the Astros should be good enough to get by without him while he gets himself healthy.